Well, it looks like VoiceThread is moving up in the world of education technology. Educause just featured it in its acclaimed "7 Things You Should Know" series which is a wonderful resource for faculty and instructional designers eager to consume clear examples of how specific emerging technologies can be applied in educational contexts to support learning. Be sure to check out the series if it's new to you. In one recent evaluation at Sierra College, where VoiceThread was used in distance learning courses in art appreciation and art history, students noted that the tool helped establish a sense of community and reinforced the impression that the instructor was involved in their learning process. 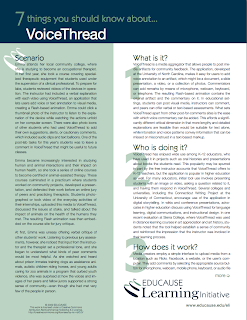 VoiceThread might require a rethinking of traditional approaches to assessment. Because VoiceThread does not allow multiple users to have simultaneous access to the same account, it may be necessary for an entire class to use a single class account login. As a result, students could remove or change comments made by others or inadvertently delete an entire VoiceThread. As with other multimedia-based applications, VoiceThread presents an accessibility problem for some users. The application can be slow or quirky and does not function uniformly across all browsers, raising questions about its robustness. Because VoiceThread produces Flash movies, using the application from a mobile phone can be problematic. I'm not understanding why multiple users (students) would need access to a single account in order to accomodate an assessment. If an instructor creates an assessment (like a template in VoiceThread) and each student has his/her own free VoiceThread account, then each student easily logs into that account online from anywhere and completes the activity. The comment moderation tools comes in handy for instructors who haven't completely made the transition to collaborative, formative models of learning assessements. Maybe I'm missing something here but I just don't see this as an issue with VoiceThread at all. The bigger issue to me is the accessibility concern which is referenced, although minimally, and I've noted in an earlier post VoiceThread has stepped up and is resolving this issue -- yeah, VoiceThread! Hi Michelle, What a great blog! I appreciate your posts on Voicethread. I've used Voicethreads on what I call the "Digital Tourist Project" to encourage teachers to try out new technologies. The response has been very positive, and I was excited when a colleague shared the link to your blog. Hi Tom, thanks so much for your comment. I appreciate knowing you're reading -- do come back. I have some exciting updates I'll be sharing soon regarding some work I am doing with Educause for the fall. I am happy to hear you've taken on some ways of enticing educators to try out new technologies. Do stay in touch! Thanks for sharing your review in reference to Voice Thread. I just participated in a VoiceThread discussion for a class I'm taking and there was no need for a common log in. As you said, we just created our own individual accounts and then went to the discussion. It is a cool tool for sure, but I want to learn more about accessibility issues.